By now you’ve probably heard about browser changes starting in January 2017. Have you transitioned your website from HTTP to HTTPs? If not, you’re running out of time! Major browsers will flag non-secure websites (i.e. HTTP) that accept passwords or payments with a security alert. Ultimately, all non-secure websites will display a security warning in the address bar. Join our webinar for a "Step-by-Step: How to Transition from HTTP to HTTPS"
Radical transformation in business enabled through the interconnectivity of devices and applications coupled with significant global political changes continue to guide and define the policy landscape. The Internet of Things has revolutionized the way everything and everyone is connected, 24/7. This smart revolution has a huge impact on all industries globally. A recent global study found that by 2020, over 70% companies surveyed are expecting to dramatically increase their overall level of digitization. Businesses and governments must monitor policy changes; assess the potential implications of these developments on their operations and customers; develop strategies to achieve compliance; prioritize resources and investments; and ensure compliance with any new requirements. Join us as we uncover the persistent global cybersecurity challenges and major developments in the cybersecurity and data protection policy landscape that organizations across the globe are facing. Cyber attackers revealed new levels of ambition in 2016. Attackers have begun to change their tactics, expanding their range of tools and in many instances, groups are no longer as reliant on the traditional attack toolkit of malware and zero-day vulnerabilities. This webinar will share data from ISTR 22 to better understand the threats and trends that will affect us in 2017. It will cover key findings of the report and best practices to keep you protected in 2017. Be the first to gain insights into the latest cyber threat trends to improve your security posture in 2017. Combining forces for a safer internet: Symantec & VISA explore the latest PCI eCommerce guidelines & how best practices can benefit you, your customers and your business. Join us for a discussion about the cross-organizational responsibility of earning trust and gain awareness of how compliance impacts profitability. Utilize insights into the evolving cybersecurity landscape to shape customer confidence and online success. With numerous certificates sited across multiple locations and geographies, ensuring continuity and compliance has become a time-consuming, costly, and risky business for enterprises. In this 30-45 minute webinar you'll learn how Symantec Discovery can help to ensure continuity and compliance, and deliver peace of mind when it comes to your SSL/TLS certificate real estate. With an upcoming release of the Chrome browser, Google has provided you with an important reason to secure your entire website and online applications. In January 2017, Google and other browsers will begin flagging non-secure sites that accept passwords or payments with a security alert, letting users know their data is not protected. Ultimately, all non-secure sites will have a security warning. During this live event, we will take you through the upcoming browser changes, what to expect and how you can prepare for new requirements. While Symantec Website Security has been advocating for stronger, better, more powerful privacy and innovative encryption standards on the Internet for years, Google is giving businesses a compelling reason to act now. Hear the latest on the current website security threats for November 2016 from Symantec. We’ll share with you why this move has huge implications and how you can build trust with your customers and eliminate security risk for your organization. 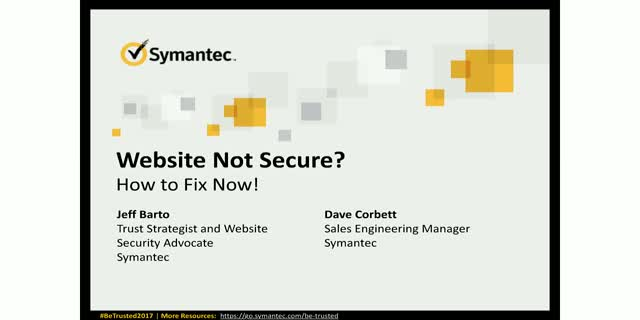 Hear the latest on the current website security threats for October 2016 from Symantec. Learn how to manage your Code Signing certificate using the new Thawte Certificate Center. This is the perfect session for getting started. You’ll get to see how to do everyday tasks and ask questions to our Thawte Code Signing expert, so you can manage your certificates with confidence. Learn how to manage your Code Signing certificate using the Symantec Trust Center. This is the perfect session for getting started. You’ll get to see how to do everyday tasks and ask questions to our Symantec Code Signing expert, so you can manage your certificates with confidence. Learn how to manage your RapidSSL account all in one spot. We’re really excited to show you how much easier it’s going to be to manage your SSL certificates. This is the perfect session for getting started. You’ll get to see how to do everyday tasks and ask questions of our RapidSSL experts, so you can manage your certificates with confidence. Symantec's annual report on the latest cybercrime trends and developments. Stay informed. Stay secure. The latest DDoS Threat Report from Imperva Incapsula shows that DDoS attacks continue to grow in size with a significant increase in network layer attacks. With the scale and reach of DDoS threats increasing, enterprises need to be vigilant to protect their assets and customer data. Join our webinar to learn how you can protect your enterprise from global cybersecurity threats.